California Group Uses ID-Theft/Casino Credit Scam to Bilk State's Casinos Out of $1 Million--Ringleader Convicted--Scam Eerily Similar to Scam Portrayed on Richard Marcus Scam of the Month Page! Following a two-week jury trial, a southern California man has been convicted of defrauding several local casinos of about $1 million by using recruits to obtain casino credit markers that were not paid back, announced Daniel G. Bogden, United States Attorney for the District of Nevada. De Rong Shang, aka Jason Shang, 50, of San Gabriel, California, was convicted on Tuesday, March 27, 2012 of one count of conspiracy to commit mail fraud and 17 counts of mail fraud. Shang faces up to 360 years in prison and $4.5 million in fines and is scheduled to be sentenced by U.S. District Judge Roger L. Hunt on July 16, 2012. From about December 2006 to April 2007, Shang conducted a conspiracy and scheme to defraud casinos in Las Vegas. Shang and co-defendant Yuli Eaton, 47, of Redlands, California, who pleaded guilty to conspiracy before trial, recruited persons to open bank accounts that were funded by Shang. Shang then helped the recruits apply for lines of credit at several Las Vegas casinos. Once the lines of credit were approved, the recruits transferred the money from their accounts to Shang’s account. 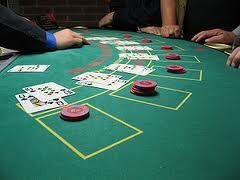 The recruits then withdrew chips from their lines of credit (“markers”) and played baccarat at the casinos. The recruits were instructed to use a process known as rolling the chips to make it look like they were actually losing money, when they were actually just hiding chips and transferring them to other co-conspirators. The recruits then applied for higher lines of credit and played baccarat, again using the rolling process to make it look like they had lost. In actuality, they gave the chips to Shang, who cashed them in. The recruits then left Nevada or the country and were paid a small percentage of the total amount of credit under their name, generally $300 per $10,000 line of credit. The casinos attempted to collect the unpaid markers, but by that time, the accounts had been drained or closed. Using this scheme, Shang and Eaton defrauded three local casinos of $1,011,400. The investigation was conducted by the FBI, and the case was prosecuted by Assistant U.S. Attorneys Andrew W. Duncan and Brandon C. Jaroch. This law enforcement action is sponsored by President Barack Obama’s Financial Fraud Enforcement Task Force. President Obama established the interagency Financial Fraud Enforcement Task Force to wage an aggressive, coordinated, and proactive effort to investigate and prosecute financial crimes. The task force includes representatives from a broad range of federal agencies, regulatory authorities, inspectors general, and state and local law enforcement who, working together, bring to bear a powerful array of criminal and civil enforcement resources. The task force is working to improve efforts across the federal executive branch, and with state and local partners, to investigate and prosecute significant financial crimes, ensure just and effective punishment for those who perpetrate financial crimes, combat discrimination in the lending and financial markets, and recover proceeds for victims of financial crimes. My take: Sounds like they got the idea right off this website! If you don't believe it, look here. and scroll down to "Casino Credit/Identity Theft Scam. A person suspected of getting a hidden camera installed at Kangwon Land Casino to cheat at games is known to have fled to China, said police in Jeongseon, Gangwon Province on Monday. The suspect departed for Shanghai from Seoul Thursday last week, police said. Two casino workers who were arrested informed investigators of the suspect`s mobile phone number while identifying him through surveillance camera footage, but the suspect had fled. Police also said, "Though an extradition treaty with China took effect in April 2002, we have yet to request Chinese cooperation with the investigation. We`re urging the suspect`s acquaintances to help him return." The probe is expected to be prolonged due to the overseas flight of the suspect. Known to have been the middle man between scheming gamblers and casino workers, he is suspected of ordering the two staff members to move a card box with tiny video cameras installed to a baccarat table, promising them 10 percent of profits. Police are also probing 21 players who were at the game tables when the card box was found a week ago. After questioning eight of them, investigators found that one player won 1.6 million won (1,421 U.S. dollars) but found no suspicious circumstances. Two gamblers who said they saw a red light coming from a card box initially agreed to face police questioning, but did not show up as scheduled Wednesday. Police said they will ask them how they found the card box in addition to asking about other situations. Despite news of the scandal, the casino was packed with customers Monday, with more than 6,000 going there weekdays and 8,000 weekends. Immediately after the casino opened at 10 a.m., most of the seats were taken except for certain machine games. At the most popular baccarat and blackjack tables, people had to stand behind seats that were occupied. All of them seemed unaffected by the hidden camera scandal. A man in his 50s who was waiting for a seat at a blackjack table said, "I don`t care because the cheating gamblers did no harm to other gamblers. You lose money as you play casino longer. Does this mean that gambling is a legal act of fraud?" My take: Seems like a big to-do about a sophisticated high-tech baccarat cheat scam that garnered little money.